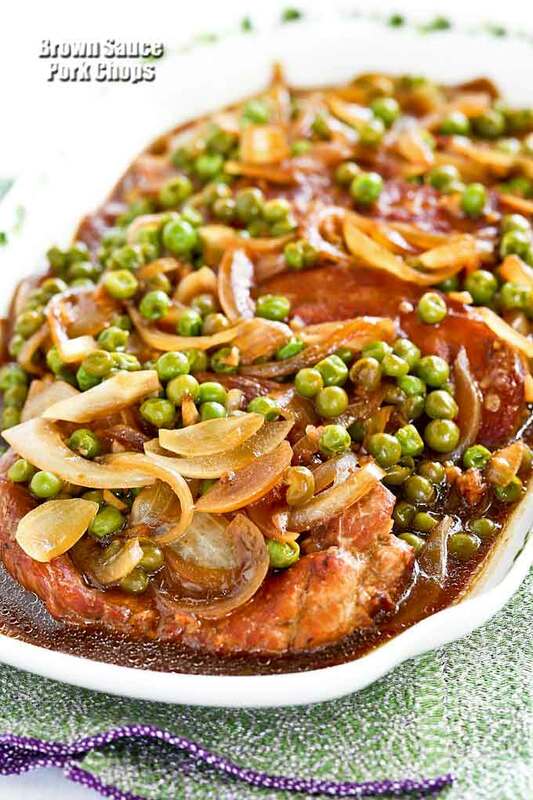 This Brown Sauce Pork Chops is a mainstay at our house. It is one of those dishes that I grew up with and in my perspective, has been around forever. Mom made this dish quite often as my brothers and I enjoyed it very much. I guess one never outgrow certain dishes and this is certainly one of them. I continue to cook it to this day for Ro-Ri San and the boys. It is always a favorite at our house. Back in the old days, we seldom use a dedicated meat pounder. Mom uses the back of her knife to “tenderize” meats. I do that too and you will see me pounding away with the back of my santoku in the video. So much easier using just the knife. One less thing to wash during cleanup. Mom used mainly soy sauce and dark soy sauce to cook her pork chops. 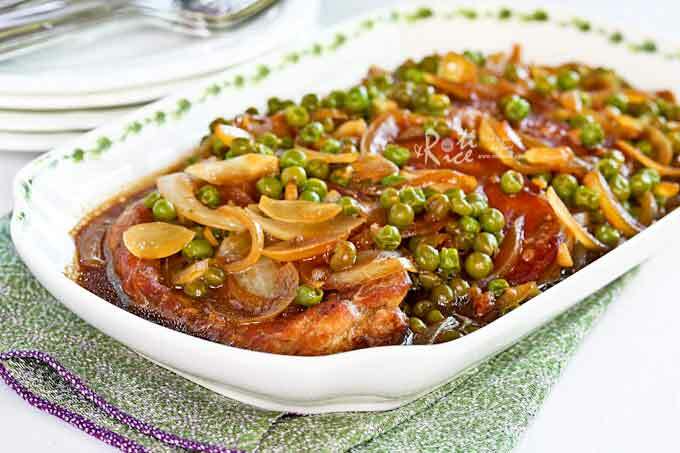 I think Worcestershire sauce goes particularly well with pork and so I added some to my version of this dish. It is good either way. Place pork loin chops on a cutting board. Pound chops on both sides in cross-hatch pattern with the back of the knife. Transfer to a tray. Sprinkle ground pepper and sugar and drizzle dark soy sauce on both sides of pork chops. Heat vegetable oil in a large pan. Brown pork chops for 3 minutes on each side. Remove and set aside. Add onion and garlic to the pan. Stir fry for 1 to 2 minutes. Then return pork chops to the pan. Add Worcestershire sauce and water. Cover pan and bring sauce to a boil. Remove lid, add frozen green peas and salt. Cover and continue to cook for another 5 minutes. Remove lid. Pour in corn starch mixture. When sauce thickens, turn off stove. 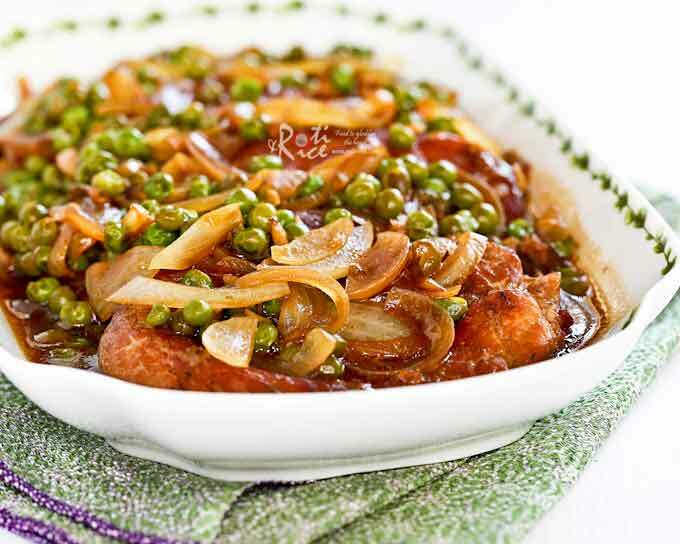 At our house, these Brown Sauce Pork Chops are served with rice. It will also be wonderful served with mashed potatoes or this Fingerling Potato Salad. I hope you’ll give it a try soon. NOTE: This post was originally published on January 19th, 2010. It has been updated on October 19th, 2017 with new write up, pictures, and a video. Minor changes were made to the recipe for clarity.